Not to be confused with 1991 Soviet coup d'état attempt. The constitutional crisis of 1993 was a political stand-off between the Russian president Boris Yeltsin and the Russian parliament that was resolved by using military force. The relations between the president and the parliament had been deteriorating for some time. The constitutional crisis reached a tipping point on September 21, 1993, when President Yeltsin aimed to dissolve the country's legislature (the Congress of People's Deputies and its Supreme Soviet), although the president did not have the power to dissolve the parliament according to the constitution. Yeltsin used the results of the referendum of April 1993 to justify his actions. In response, the parliament declared that the president's decision was null and void, impeached Yeltsin and proclaimed vice president Aleksandr Rutskoy to be acting president. On October 3, demonstrators removed police cordons around the parliament and, urged by their leaders, took over the Mayor's offices and tried to storm the Ostankino television centre. The army, which had initially declared its neutrality, stormed the Supreme Soviet building in the early morning hours of October 4 by Yeltsin's order, and arrested the leaders of the resistance. The ten-day conflict became the deadliest single event of street fighting in Moscow's history since the Russian Revolution. According to government estimates, 187 people were killed and 437 wounded. The Soviet Union broke up on 26 December 1991. Yeltsin's economic reform program took effect on January 2, 1992. Soon afterward prices skyrocketed, government spending was slashed, and heavy new taxes went into effect. A deep credit crunch shut down many industries and brought about a protracted depression. Certain politicians quickly began to distance themselves from the program; and increasingly the ensuing political confrontation between Yeltsin on the one side, and the opposition to radical economic reform on the other, became centered in the two branches of government. Throughout 1992, opposition to Yeltsin's reform policies grew stronger and more intractable among bureaucrats concerned about the condition of Russian industry and among regional leaders who wanted more independence from Moscow. Russia's vice president, Aleksandr Rutskoy, denounced the Yeltsin program as "economic genocide". Indeed, during the first half of 1992, the average income of the population declined 2–2.5 times. [clarification needed] Leaders of oil-rich republics such as Tatarstan and Bashkiria called for full independence from Russia. Also throughout 1992, Yeltsin wrestled with the Supreme Soviet (the standing legislature) and the Russian Congress of People's Deputies (the country's highest legislative body, from which the Supreme Soviet members were drawn) for control over government and government policy. In 1992 the speaker of the Russian Supreme Soviet, Ruslan Khasbulatov, came out in opposition to the reforms, despite claiming to support Yeltsin's overall goals. The president was concerned about the terms of the constitutional amendments passed in late 1991, which meant that his special powers of decree were set to expire by the end of 1992 (Yeltsin expanded the powers of the presidency beyond normal constitutional limits in carrying out the reform program). Yeltsin, awaiting implementation of his privatization program, demanded that parliament reinstate his decree powers (only parliament had the authority to replace or amend the constitution). But in the Russian Congress of People's Deputies and in the Supreme Soviet, the deputies refused to adopt a new constitution that would enshrine the scope of presidential powers demanded by Yeltsin into law. During its December session the parliament clashed with Yeltsin on a number of issues, and the conflict came to a head on December 9 when the parliament refused to confirm Yegor Gaidar, the widely unpopular architect of Russia's "shock therapy" market liberalizations, as prime minister. The parliament refused to nominate Gaidar, demanding modifications of the economic program and directed the Central Bank, which was under the parliament's control, to continue issuing credits to enterprises to keep them from shutting down. In an angry speech the next day on December 10, Yeltsin accused the Congress of blocking the government's reforms and suggested the people decide on a referendum, "which course do the citizens of Russia support? The course of the President, a course of transformations, or the course of the Congress, the Supreme Soviet and its Chairman, a course towards folding up reforms, and ultimately towards the deepening of the crisis." Parliament responded by voting to take control of the parliamentary army. On December 12, Yeltsin and parliament speaker Khasbulatov agreed on a compromise that included the following provisions: (1) a national referendum on framing a new Russian constitution to be held in April 1993; (2) most of Yeltsin's emergency powers were extended until the referendum; (3) the parliament asserted its right to nominate and vote on its own choices for prime minister; and (4) the parliament asserted its right to reject the president's choices to head the Defense, Foreign Affairs, Interior, and Security ministries. Yeltsin nominated Viktor Chernomyrdin to be prime minister on December 14, and the parliament confirmed him. Yeltsin's December 1992 compromise with the seventh Congress of the People's Deputies temporarily backfired. Early 1993 saw increasing tension between Yeltsin and the parliament over the language of the referendum and power sharing. In a series of collisions over policy, the congress whittled away the president's extraordinary powers, which it had granted him in late 1991. The legislature, marshaled by Speaker Ruslan Khasbulatov, began to sense that it could block and even defeat the president. The tactic that it adopted was gradually to erode presidential control over the government. In response, the president called a referendum on a constitution for April 11. The eighth Congress of People's Deputies opened on March 10, 1993 with a strong attack on the president by Khasbulatov, who accused Yeltsin of acting unconstitutionally. In mid-March, an emergency session of the Congress of People's Deputies voted to amend the constitution, strip Yeltsin of many of his powers, and cancel the scheduled April referendum, again opening the door to legislation that would shift the balance of power away from the president. The president stalked out of the congress. Vladimir Shumeyko, first deputy prime minister, declared that the referendum would go ahead, but on April 25. The parliament was gradually expanding its influence over the government. On March 16, the president signed a decree that conferred Cabinet rank on Viktor Gerashchenko, chairman of the central bank, and three other officials; this was in accordance with the decision of the eighth congress that these officials should be members of the government. The congress' ruling, however, had made it clear that as ministers they would continue to be subordinate to parliament. In general, the parliament's lawmaking activity decreased in 1993, as its agenda increasingly became to be dominated by efforts to increase the parliamentarian powers and reduce those of the president. The president's response was dramatic. On March 20, Yeltsin addressed the nation directly on television, declaring that he had signed a decree on a "special regime" ("Об особом порядке управления до преодоления кризиса власти"), under which he would assume extraordinary executive power pending the results of a referendum on the timing of new legislative elections, on a new constitution, and on public confidence in the president and vice-president. Yeltsin also bitterly attacked the parliament, accusing the deputies of trying to restore the Soviet-era order. Soon after Yeltsin's televised address, Valery Zorkin (Chairman of the Constitutional Court of the Russian Federation), Yuri Voronin (first vice-chairman of the Supreme Soviet), Alexander Rutskoy and Valentin Stepankov (Prosecutor General) made an address, publicly condemning Yeltsin's declaration as unconstitutional. On March 23, though not yet possessing the signed document, the Constitutional Court ruled that some of the measures proposed in Yeltsin's TV address were unconstitutional. However, the decree itself, that was only published a few days later, did not contain unconstitutional steps. The ninth congress, which opened on March 26, began with an extraordinary session of the Congress of People's Deputies taking up discussions of emergency measures to defend the constitution, including impeachment of President Yeltsin. Yeltsin conceded that he had made mistakes and reached out to swing voters in parliament. Yeltsin narrowly survived an impeachment vote on March 28, votes for impeachment falling 72 short of the 689 votes needed for a 2/3 majority. The similar proposal to dismiss Ruslan Khasbulatov, the chairman of the Supreme Soviet was defeated by a wider margin (339 in favour of the motion), though 614 deputies had initially been in favour of including the re-election of the chairman in the agenda, a tell-tale sign of the weakness of Khasbulatov's own positions (517 votes for would have sufficed to dismiss the speaker). By the time of the ninth Congress, the legislative branch was dominated by the joint communist-nationalist Russian Unity bloc, which included representatives of the CPRF and the Fatherland faction (communists, retired military personnel, and other deputies of a socialist orientation), Agrarian Union, and the faction "Russia" led by Sergey Baburin. Together with more 'centrist' groups (e.g. 'Change' (Смена)), the Yeltsin supporters ('Democratic Russia', 'Radical democrats') were clearly left in the minority. The referendum would go ahead, but since the impeachment vote failed, the Congress of People's Deputies sought to set new terms for a popular referendum. The legislature's version of the referendum asked whether citizens had confidence in Yeltsin, approved of his reforms, and supported early presidential and legislative elections. The parliament voted that in order to win, the president would need to obtain 50 percent of the whole electorate, rather than 50 percent of those actually voting, to avoid an early presidential election. This time, the Constitutional Court supported Yeltsin and ruled that the president required only a simple majority on two issues: confidence in him, and economic and social policy; he would need the support of half the electorate in order to call new parliamentary and presidential elections. On April 25, a majority of voters expressed confidence in the president and called for new legislative elections. Yeltsin termed the results a mandate for him to continue in power. Before the referendum, Yeltsin had promised to resign, if the electorate failed to express confidence in his policies. Although this permitted the president to declare that the population supported him, not the parliament, Yeltsin lacked a constitutional mechanism to implement his victory. As before, the president had to appeal to the people over the heads of the legislature. On 1 May, antigovernment protests organized by the hardline opposition turned violent. Numerous deputies of the Supreme Soviet took part in organizing the protest and in its course. One OMON police officer suffered fatal injuries during the riot. As a reaction, a number of the representatives of Saint Petersburg intelligentia (e.g., Oleg Basilashvili, Alexey German, Boris Strugatsky) sent a petition to president Yeltsin, urging "putting an end to the street criminality under political slogans". On April 29, 1993, Boris Yeltsin released the text of his proposed constitution to a meeting of government ministers and leaders of the republics and regions, according to ITAR-TASS. On 12 May Yeltsin called for a special assembly of the Federation Council, which had been formed July 17, 1990 within the office of the Chairman of the Presidium of the Supreme Soviet of the Russian SFSR, and other representatives, including political leaders from a wide range of government institutions, regions, public organizations, and political parties, to finalize a draft for a new constitution from June 5–10, and was followed by a similar decree 21 May. After much hesitation, the Constitutional Committee of the Congress of People's Deputies decided to participate and present its own draft constitution. Of course, the two main drafts contained contrary views of legislative-executive relations. Some 700 representatives at the conference ultimately adopted a draft constitution on July 12 that envisaged a bicameral legislature and the dissolution of the congress. But because the convention's draft of the constitution would dissolve the congress, there was little likelihood that the congress would vote itself out of existence. The Supreme Soviet immediately rejected the draft and declared that the Congress of People's Deputies was the supreme lawmaking body and hence would decide on the new constitution. The parliament was active in July, while the president was on vacation, and passed a number of decrees that revised economic policy in order to "end the division of society." It also launched investigations of key advisers of the president, accusing them of corruption. The president returned in August and declared that he would deploy all means, including circumventing the constitution, to achieve new parliamentary elections. In July, the Constitutional Court of the Russian Federation confirmed the election of Pyotr Sumin to head the administration of the Chelyabinsk oblast, something that Yeltsin had refused to accept. As a result, a situation of dual power existed in that region from July to October in 1993, with two administrations claiming legitimacy simultaneously. Another conflict involved the decision of the Constitutional Court of the Russian Federation regarding the regional presidency in Mordovia. The court delegated the question of legality of abolishing the post of the region's president to the Constitutional Court of Mordovia. As a result, popularly elected President Vasily Guslyannikov [ru], member of the pro-Yeltsin Democratic Russia movement, lost his position. Thereafter, the state news agency (ITAR-TASS) ceased to report on a number of Constitutional Court decisions. The Supreme Soviet also tried to further foreign policies that differed from Yeltsin's line. Thus, on July 9, 1993, it passed a resolutions on Sevastopol, "confirming the Russian federal status" of the city. Ukraine saw its territorial integrity at stake and filed a complaint to the Security Council of the UN. Yeltsin condemned the resolution of the Supreme Soviet. In August 1993, a commentator reflected on the situation as follows: "The President issues decrees as if there were no Supreme Soviet, and the Supreme Soviet suspends decrees as if there were no President." (Izvestiya, August 13, 1993). The president launched his offensive on September 1 when he attempted to suspend Vice President Rutskoy, a key adversary. Rutskoy, elected on the same ticket as Yeltsin in 1991, was the president's automatic successor. A presidential spokesman said that he had been suspended because of "accusations of corruption." On September 3, the Supreme Soviet rejected Yeltsin's suspension of Rutskoy and referred the question to the Constitutional Court. Two weeks later Yeltsin declared that he would agree to call early presidential elections provided that the parliament also called elections. The parliament ignored him. On September 18, Yeltsin then named Yegor Gaidar, who had been forced out of office by parliamentary opposition in 1992, a deputy prime minister and a deputy premier for economic affairs. This appointment was unacceptable to the Supreme Soviet, which emphatically rejected it. The powers of the President of Russian Federation cannot be used to change the national and state organization of the Russian Federation, to dissolve or to interfere with the functioning of any elected organs of state power. In this case, his powers cease immediately. For a long time already, most of the sessions of the Supreme Soviet take place with the infringements of the elementary procedures and order... A cleansing of committees and commissions is taking place. Everyone who does not show up personal loyalty to its leader is being mercilessly expelled from the Supreme Soviet, from its presidium. [...] This is all a bitter evidence of the fact that the Supreme Soviet as a state institution is currently in a state of decay [...]. The power in the Supreme Soviet has been captured by a group of persons who have turned it into an HQ of the intransigent opposition. [...] The only way how to overcome the paralysis of the state authority in the Russian Federation is its fundamental renewal on the basis of the principles of popular power and constitutionality. The constitution currently in force does not allow to do this. The constitution in force also does not provide for a procedure of passing a new constitution, that would provide for a worthy exit from the crisis of state power. I as the guarantor of the security of our state have to propose an exit from this deadlock, have to break this vicious circle. Yeltsin claimed that by dissolving the Russian parliament in September 1993 he was clearing the tracks for a rapid transition to a functioning market economy. With this pledge, he received strong backing from the leading powers of the West. Yeltsin enjoyed a strong relationship with the Western powers, particularly the United States, but the relationship made him unpopular with some Russians. In Russia, the Yeltsin side had control over television, where hardly any pro-parliament views were expressed during the September–October crisis. Rutskoy called Yeltsin's move a step toward a coup d'etat. The next day, the Constitutional Court held that Yeltsin had violated the constitution and could be impeached. During an all-night session, chaired by Khasbulatov, parliament declared the president's decree null and void. Rutskoy was proclaimed president and took the oath on the constitution. He dismissed Yeltsin and the key ministers Pavel Grachev (defense), Nikolay Golushko (security), and Viktor Yerin (interior). Russia now had two presidents and two ministers of defense, security, and interior. It was dual power in earnest. Although Gennady Zyuganov and other top leaders of the Communist Party of the Russian Federation did not participate in the events, individual members of communist organizations actively supported the parliament. On September 23, the Congress of People's deputies convened. Though only 638 deputies were present (the quorum was 689), Congress purported to impeach Yeltsin. On September 24, an undaunted Yeltsin announced presidential elections for June 1994. The same day, the Congress of People's Deputies voted to hold simultaneous parliamentary and presidential elections by March 1994. Yeltsin scoffed at the parliament-backed proposal for simultaneous elections, and responded the next day by cutting off electricity, phone service, and hot water in the parliament building. Yeltsin also sparked popular unrest with his dissolution of a parliament increasingly opposed to his neoliberal economic reforms. Tens of thousands of Russians marched in the streets of Moscow seeking to bolster the parliamentary cause. The demonstrators were protesting against the deteriorating living conditions. Since 1989, the GDP had been declining, corruption was rampant, violent crime was skyrocketing, medical services were collapsing and life expectancy falling. Yeltsin was also increasingly getting the blame. [note 3] Outside Moscow, the Russian masses overall were confused and disorganized. Nonetheless, some of them also tried to voice their protest, and sporadic strikes took place across Russia. The protesters included supporters of various communist (Labour Russia) and nationalist organizations, including those belonging to the National Salvation Front. A number of armed militants of Russian National Unity took part in the defense of the White House, as reportedly did veterans of Tiraspol and Riga OMON. The presence of Transnistrian forces, including the KGB detachment 'Dnestr', stirred General Alexander Lebed to protest against Transnistrian interference in Russia's internal affairs. On September 28, Moscow saw the first bloody clashes between the special police and anti-Yeltsin demonstrators. Also on the same day, the Interior Ministry moved to seal off the parliament building. Barricades and wire were put around the building. On October 1, the Interior Ministry estimated that 600 fighting men with a large cache of arms had joined Yeltsin's political opponents in the parliament building. Soviet leaders still did not discount the prospect of a compromise with Yeltsin. The Russian Orthodox Church acted as a host to desultory discussions between representatives of the parliament and the president. The negotiations with the Russian Orthodox Patriarch as mediator continued until October 2. On the afternoon of October 3, Moscow police failed to control a demonstration near the White House, and the political impasse developed into armed conflict. On October 2, supporters of parliament constructed barricades and blocked traffic on Moscow's main streets. On the afternoon of October 3, armed opponents of Yeltsin successfully stormed the police cordon around the White House territory, where the Russian parliament was barricaded. Paramilitaries from factions supporting the parliament, as well as a few units of the internal military (armed forces normally reporting to the Ministry of Interior), supported the Supreme Soviet. Rutskoy greeted the crowds from the White House balcony, and urged them to form battalions and to go on to seize the mayor's office and the national television center at Ostankino. Khasbulatov also called for the storming of the Kremlin and imprisoning "the criminal and usurper Yeltsin" in Matrosskaya Tishina. At 16:00 Yeltsin signed a decree declaring a state of emergency in Moscow. On the evening of October 3, after taking the mayor's office located in the former Comecon HQ nearby, pro-parliament demonstrators and gunmen led by General Albert Makashov moved toward Ostankino, the television center. But the pro-parliament crowds were met by Interior Ministry units and special forces who took positions in and around the TV complex. A pitched battle followed. Part of the TV center was significantly damaged. Television stations went off the air and 62 people were killed, including Terry Michael Duncan, an American lawyer, who was in Moscow to establish a law firm and was killed while attempting to help the wounded. Before midnight, the Interior Ministry's units had turned back the parliament loyalists. When broadcasting resumed late in the evening, vice-premier Yegor Gaidar called on television for a meeting in support of democracy and President Yeltsin "so that the country would not be turned yet again into a huge concentration camp". A number of people with different political convictions and interpretations over the causes of the crisis (such as Grigory Yavlinsky, Alexander Yakovlev, Yuri Luzhkov, Ales Adamovich, and Bulat Okudzhava) also appealed to support the President. Similarly, the Civic Union bloc of 'constructive opposition' issued a statement accusing the Supreme Soviet of having crossed the border separating political struggle from criminality. Several hundred of Yeltsin's supporters spent the night in the square in front of the Moscow City Hall preparing for further clashes, only to learn in the morning of October 4 that the army was on their side. The Ostankino killings went unreported by Russian state television. The only independent Moscow radio station's studios were burnt. Two French, one British and one American journalist were killed by sniper fire during the massacre. A fifth journalist died from a heart attack. The press and broadcast news were censored starting on 4 October, and by the middle of October, prior censorship was replaced by punitive measures. Between October 2–4, the position of the army was the deciding factor. The military equivocated for several hours about how to respond to Yeltsin's call for action. By this time dozens of people had been killed and hundreds had been wounded. Rutskoy, as a former general, appealed to some of his ex-colleagues. After all, many officers and especially rank-and-file soldiers had little sympathy for Yeltsin. But the supporters of the parliament did not send any emissaries to the barracks to recruit lower-ranking officer corps, making the fatal mistake of attempting to deliberate only among high-ranking military officials who already had close ties to parliamentary leaders. In the end, a prevailing bulk of the generals did not want to take their chances with a Rutskoy-Khasbulatov regime. Some generals had stated their intention to back the parliament, but at the last moment moved over to Yeltsin's side. The plan of action was proposed by Captain Gennady Zakharov. Ten tanks were to fire at the upper floors of the White House, with the aim of minimizing casualties but creating confusion and panic amongst the defenders. Then, special troops of the Vympel and Alpha units would storm the building. 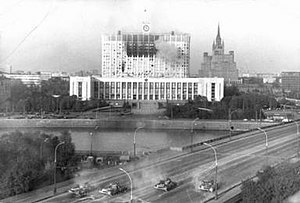 According to Yeltsin's bodyguard Alexander Korzhakov, firing on the upper floors was also necessary to scare off snipers. Those, who went against the peaceful city and unleashed bloody slaughter, are criminals. But this is not only a crime of individual bandits and pogrommakers. Everything that took place and is still taking place in Moscow is a pre-planned armed rebellion. It has been organized by Communist revanchists, Fascist leaders, a part of former deputies, the representatives of the Soviets. Under the cover of negotiations they gathered forces, recruited bandit troops of mercenaries, who were accustomed to murders and violence. A petty gang of politicians attempted by armed force to impose their will on the entire country. The means by which they wanted to govern Russia have been shown to the entire world. These are the cynical lie, bribery. These are cobblestones, sharpened iron rods, automatic weapons and machine guns. Those, who are waving red flags, again stained Russia with blood. They hoped for the unexpectedness, for the fact that their impudence and unprecedented cruelty will sow fear and confusion. Fascist-communist armed rebellion in Moscow shall be suppressed within the shortest period. The Russian state has necessary forces for this. By noon, troops entered the White House and began to occupy it, floor by floor. Rutskoy's desperate appeal to Air Force pilots to bomb the Kremlin was broadcast by the Echo of Moscow radio station but went unanswered. He also tried to have the Chairman of the Constitutional Court, Valery Zorkin call the Western embassies to guarantee Rutskoy's and his associates' safety - to no avail. Hostilities were stopped several times to allow some in the White House to leave. By mid-afternoon, popular resistance in the streets was completely suppressed, barring occasional sniper fire. The "second October Revolution", as mentioned, saw the deadliest street fighting in Moscow since 1917. Police said, on October 8, that 187 had died in the conflict and 437 had been wounded. Some claim Yeltsin was backed by the military only grudgingly, and only at the eleventh hour. [clarification needed] The instruments of coercion gained the most, and they would expect Yeltsin to reward them in the future. A paradigmatic example of this was General Pavel Grachev, who had demonstrated his loyalty during this crisis. Grachev became a key political figure, despite many years of charges that he was linked to corruption within the Russian military. The Russian public opinion research institute VCIOM (VTsIOM), a state-controlled agency, conducted a poll in the aftermath of October 1993 events and found out that 51% of the people polled thought that the use of military force by Yeltsin was justified and 30% thought it was not justified. This support for Yeltsin's actions declined in later years. When VCIOM-A asked the same question in 2003, only 20% agreed with the use of the military, with 57% opposed. When asked about the main cause of the events of October 3–4, 46% in the 1993 VCIOM poll blamed Rutskoy and Khasbulatov. However, ten years following the crisis, the most popular culprit was the legacy of Mikhail Gorbachev with 31%, closely followed by Yeltsin's policies with 29%. In 1993, a majority of Russians considered the events of September 21–October 4 as an attempt of Communist revanche or as a result of Rutskoy and Khasbulatov seeking personal power. All kinds of сommunist and nationalist parties, fronts, and associations should be disbanded and banned by a decree of the President. All illegal paramilitary and a fortiori armed groups and associations should be identified and disbanded (with bringing them to criminal responsibility when it is bound by a law). Legislation providing for heavy sanctions for propaganda of fascism, chauvinism, racial hatred, for calls for violence and brutality should finally begin to work. Prosecutors, investigators, and judges patronizing such socially dangerous crimes should be immediately removed from their work. The organs of the press, which from day to day inspire hatred, call for violence and are, in our opinion, one of the main organizers and perpetrators of the tragedy (and potential perpetrators of a multitude of future tragedies), such as Den, Pravda, Sovetskaya Rossiya, Literaturnaya Rossiya (as well as the television program 600 Seconds) and a number of others, should be closed until the judicial proceedings start. The activities of bodies of the Soviet authority which refused to obey the legitimate authority of Russia should be suspended. We all together must prevent the trial of the organizers and participants of the bloody drama in Moscow from becoming similar to that shameful farce which is called "the trial of the Gang of Eight." Recognize not only the Congress of People's Deputies, the Supreme Council but also all bodies (including the Constitutional Court) formed by them as nonlegitimate. In the weeks following the storming of the Russian White House, Yeltsin issued a barrage of presidential decrees intended to consolidate his position. On October 5, Yeltsin banned political leftist and nationalist organizations and newspapers like Den', Sovetskaya Rossiya and Pravda that had supported the parliament (they would later resume publishing). In an address to the nation on October 6, Yeltsin also called on those regional Soviets that had opposed him—by far the majority—to disband. Valery Zorkin, chairman of the Constitutional Court, was forced to resign. The chairman of the Federation of Independent Trade Unions was also sacked. The anti-Yeltsin TV broadcast 600 Seconds of Alexander Nevzorov was ultimately closed down. "Russia needs order," Yeltsin told the Russian people in a television broadcast in November in introducing his new draft of the constitution, which was to be put to a referendum on December 12. The new basic law would concentrate sweeping powers in the hands of the president. The bicameral legislature, to sit for only two years, was restricted in crucial areas. The president could choose the prime minister even if the parliament objected and could appoint the military leadership without parliamentary approval. He would head and appoint the members of a new, more powerful security council. If a vote of no confidence in the government was passed, the president would be enabled to keep it in office for three months and could dissolve the parliament if it repeated the vote. The president could veto any bill passed by a simple majority in the lower house, after which a two-thirds majority would be required for the legislation to be passed. The president could not be impeached for contravening the constitution. The central bank would become independent, but the president would need the approval of the State Duma to appoint the bank's governor, who would thereafter be independent of the parliament. At the time, most political observers regarded the draft constitution as shaped by and for Yeltsin and perhaps unlikely to survive him. On December 12, Yeltsin managed to push through his new constitution, creating a strong presidency and giving the president sweeping powers to issue decrees. However, the parliament elected on the same day (with a turnout of about 53%) delivered a stunning rebuke to his neoliberal economic program. Candidates identified with Yeltsin's economic policies were overwhelmed by a huge protest vote, the bulk of which was divided between the Communists (who mostly drew their support from industrial workers, out-of-work bureaucrats, some professionals, and pensioners) and the ultra-nationalists (who drew their support from disaffected elements of the lower middle classes). Unexpectedly, the most surprising insurgent group proved to be the ultranationalist Liberal Democratic Party led by Vladimir Zhirinovsky. It gained 23% of the vote while the Gaidar led 'Russia's Choice' received 15.5% and the Communist Party of the Russian Federation, 12.4%. LDPR leader, Vladimir Zhirinovsky, alarmed many observers abroad with his neo-fascist, chauvinist declarations. ^ Supporters of Alexander Rutskoy, the Supreme Soviet and the Congress of People's Deputies frequently used those flags. The Russian tricolor itself only remained hoisted at the White House building (see video documentary Archived July 23, 2011, at the Wayback Machine). ^ It is still hotly debated among Western economists, social scientists, and policy-makers as to whether or not the IMF-, World Bank-, and U.S. Treasury Department-backed reform policies adopted in Russia, often called "shock therapy," were responsible for Russia's poor record of economic performance in the 1990s. Under the Western-backed economic program adopted by Yeltsin, the Russian government took several radical measures at once that were supposed to stabilize the economy by bringing state spending and revenues into balance and by letting market demand determine the prices and supply of goods. Under the reforms, the government let most prices float, raised taxes, and cut back sharply on spending in industry and construction. These policies caused widespread hardship as many state enterprises found themselves without orders or financing. The rationale of the program was to squeeze the built-in inflationary pressure out of the economy so that producers would begin making sensible decisions about production, pricing and investment instead of chronically overusing resources, as in the Soviet era. By letting the market rather than central planners determine prices, product mixes, output levels, and the like, the reformers intended to create an incentive structure in the economy where efficiency and risk would be rewarded and waste and carelessness were punished. Removing the causes of chronic inflation, the reform's architects argued, was a precondition for all other reforms: Hyperinflation would wreck both democracy and economic progress, they argued; only by stabilizing the state budget could the government proceed to restructure the economy. A similar reform program had been adopted in Poland in January 1990, with generally favorable results. However, Western critics of Yeltsin's reform, most notably Joseph Stiglitz and Marshall Goldman (who would have favored a more "gradual" transition to market capitalism) consider policies adopted in Poland ill-suited for Russia, given that the impact of communism on the Polish economy and political culture was far less indelible. See 'Has Russia Been on the Right Path?' by Kenneth Rogoff, IMF, August 26, 2002. Criticism on Stiglitz's perspective can be found in 'Whence Reform? A Critique of the Stiglitz Perspective' by M. Dabrowski, S. Gomulka, J. Rostowski, Centre for Economic Performance, September 2000. ^ Urmanov, Alexandr (February 6, 1992). "The Creeping Counterrevolution in Russia: Local Resistance to Privatization". The Heritage Foundation. Archived from the original on September 26, 2007. Retrieved September 4, 2007. ^ Bohlen, Celestine (February 9, 1992). "Yeltsin Deputy Calls Reforms 'Economic Genocide". The New York Times. Retrieved December 8, 2011. ^ The Central Bank's efforts got in the way of pro-Yeltsin, Western-oriented leaders were seeking to carry out a decisive neoliberal economic transformation of Russia. They undermined the regime of fiscal austerity that the Yeltsin government was attempting to pursue. See, e.g., Thomas F. Remington, Politics in Russia (New York: Addison-Wesley Educational Publishers Inc., 2002), p. 50. ^ Румянцев, Олег Г (2008). Из истории создания Конституции Российской Федерации: Конституционная комиссия стенограммы, материалы, документы (1990–1993 гг.) в 6 томах (in Russian). Wolters Kluwer Russia. p. 784. ISBN 978-5-466-00354-3. Retrieved August 5, 2010. ^ Andrews, Josephine T (2002). When majorities fail: the Russian Parliament, 1990–1993. Cambridge University Press. p. 61. ISBN 978-0-521-80112-6. Retrieved December 8, 2011. ^ Р.Г. Пихоя. Президент и Советы: политико конституционный кризис 1993. г. (PDF) (in Russian). p. 343. Retrieved 2009-07-16. ^ Разгон Верховного Совета РФ (in Russian). Каспаров.Ru. Retrieved July 16, 2009. ^ ЗАКЛЮЧЕНИЕ Конституционного Суда Российской Федерации (in Russian). Обозреватель. March 23, 1993. Archived from the original on May 12, 2009. Retrieved 2009-04-12. ^ Белкин, A. A. (1994). Дело о Президентском обращении к народу 20 марта 1993 года (in Russian). №3. Правоведение: 48–63. Archived from the original on 2011-07-23. ^ Съезд завершен: противостояние продолжается. Kommersant (in Russian). March 30, 1993. Retrieved 2010-09-18. ^ "Ъ - Блок "Российское единство" не хочет никого свергать" (in Russian). Archived from the original on July 22, 2009. Retrieved 2009-07-13. ^ Пресс-конференция фракции "Отчизна" (in Russian). Ъ-Газета. Retrieved December 15, 2011. ^ Владимир Прибыловский: Блоки и фракции российского парламента (in Russian). Archived from the original on July 22, 2009. Retrieved 2009-07-13. ^ "Николай Анисин __ ЗАПРОС НА БАБУРИНА" (in Russian). Archived from the original on July 22, 2009. Retrieved 2009-07-13. ^ "Коммунистическая партия Российской Федерации ("Есть такие партии!")" (in Russian). Archived from the original on July 22, 2009. Retrieved 2009-07-13. ^ a b Gönenç 2002, p. 161. ^ a b Jeffries 1996, p. 110. ^ Tolz, Vera (April 29, 1993). "Yeltsin to Unveil Full Text of Draft Constitution". RFE/RL. ^ Tolz, Vera (April 30, 1993). "Yeltsin Promotes New Constitution". RFE/RL. ^ Danks, Catherine J (2001). Russian Politics and Society: An Introduction. ISBN 978-0-582-47300-3. In a move designed to appeal to Russia's regions and its non-Russian peoples Yeltsin in July 1990 had already established a Federation Council within the office of the chair of the RSFSR Supreme Soviet. ^ Tolz, Vera (May 13, 1993). "President Takes Further Steps to Speed Up Constitution Adoption". RFE/RL. ^ a b Зорькин, Валерий (in Russian). Lenta.ru. Archived from the original on May 12, 2009. Retrieved 2009-04-12. ^ Постановление Верховного Совета Российской Федерации (in Russian). Retrieved July 22, 2010. ^ "Решение Совбеза ООН по Севастополю № S/26118" (in Russian). Retrieved July 22, 2010. ^ Carey, John M; Matthew, Matthew S (1998). Executive decree authority. Cambridge University Press. p. 76. ISBN 978-0-521-59722-7. Retrieved July 15, 2009. ^ Mickiewicz, Ellen P (1999). Changing channels: television and the struggle for power in Russia. Duke University Press. p. 126. ISBN 978-0-8223-2463-8. Retrieved July 12, 2009. ^ Jeffries, Ian (1996). A Guide to the Economies in Transition. Routledge. p. 113. ISBN 978-0-415-13684-6. ^ Shapiro, Margaret (September 22, 1993). "Yeltsin Dissolves Parliament, Orders New Vote". Washington Post. Retrieved July 12, 2009. ^ Cox, David (2001). Close protection: the politics of guarding Russia's rulers. Greenwood Publishing Group. p. 78. ISBN 978-0-275-96688-1. Retrieved July 15, 2009. ^ ЛЕБЕДЬ Александр Иванович (in Russian). ПАНОРАМА. July 1998. Archived from the original on 2010-12-20. ^ ПУТЬ ГЕНЕРАЛА ЛЕБЕДЯ (in Russian). СПЕЦНАЗ РОССИИ N. May 2002. Archived from the original on 2011-06-29. ^ Taylor, Brian D (2003). Politics and the Russian army: civil-military relations, 1689–2000. Cambridge University Press. p. 290. ISBN 978-0-521-01694-0. Retrieved July 12, 2009. ^ "U.S. Lawyer Died as Hero For Russians". New York Times. 1993-10-08. Retrieved 2009-07-03. ^ Felkay, Andrew (2002). Yeltsin's Russia and the West. Greenwood Publishing Group. p. 79. ISBN 978-0-275-96538-9. Retrieved July 12, 2009. ^ "4 октября - Четырнадцатый день противостояния. Расстрел Дома Советов". Октябрь 1993. Хроника переворота (in Russian). Russian Journal. Retrieved July 12, 2009. ^ "Pavel Grachev". Rusnet. Retrieved July 12, 2009. ^ Писатели требуют от правительства решительных действий. Izvestia (in Russian). October 1993. Archived from the original on July 16, 2011. Retrieved 2011-08-21. ^ Указом Бориса Ельцина при Минпечати России создано управление по предварительной цензуре (in Russian). Энциклопедия отечественного кино. October 5, 1993. Retrieved September 19, 2010. ^ (in Russian) Леонид Прошкин - "Правых в этой истории не было"
Gönenç, Levent (2002). Prospects for Constitutionalism in Post-Communist Countries. Kluwer Law International. ISBN 90-411-1836-5. Jeffries, Ian (1996). A Guide to the Economies in Transition. Routledge. ISBN 0-415-13684-9. Steele, Jon (2003). War Junkie: One Man's Addiction to the Worst Places on Earth. Corgi Books. ISBN 978-0-552-14984-6. Ruslan Imranovich Khasbulatov is a Russian economist and politician and the Chairman of Parliament of Russia of Chechen descent who played a central role in the events leading to the 1993 constitutional crisis in the Russian Federation. A four-part referendum was held in Russia on 25 April 1993. Voters were asked questions on confidence in President Boris Yeltsin, support for the government's socio-economic policies and early elections for both the presidency and parliament. The referendum was initiated by the Congress of People's Deputies, which stipulated that Yeltsin would need to obtain 50% of the electorate, rather than 50% of valid votes. However, the Constitutional Court ruled that the president required only a simple majority on two issues: confidence in him, and economic and social policy; though he would still need the support of more than half the electorate in order to call new parliamentary and presidential elections. The Constitutional Court of the Russian Federation is a high court within the judiciary of Russia which is empowered to rule on whether certain laws or presidential decrees are in fact contrary to the Constitution of Russia. Its objective is only to protect the Constitution and deal with a few kinds of disputes where it has original jurisdiction, whereas the highest court of appeal is the Supreme Court of the Russian Federation. The Constituent Assembly of Russia was a constituent assembly of representatives of government bodies, local authorities and public organizations, convened by the Russian President Boris Yeltsin in 1993 to complete the preparation of an alternative draft of the Constitution of the Russian Federation. The First Inauguration of Boris Yeltsin as the first President of Russia took place on Wednesday, July 10, 1991. The ceremony was held at the State Kremlin Palace and it lasted about thirty minutes.